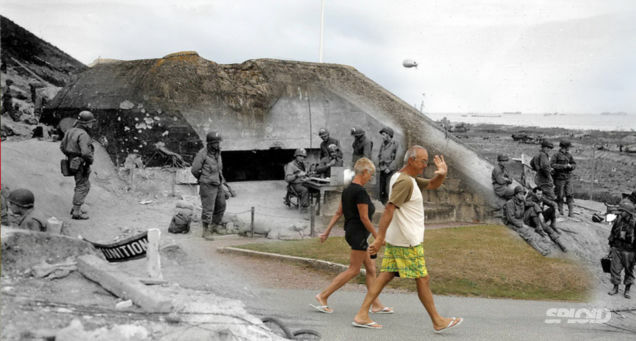 Fantastic montage of photos taken on D-Day 70 years ago and photos of the same locations today. Posted on June 8, 2014 by Jesus Diaz – Reuters photo editor Chris Helgren got some 70-year-old D-Day images and went to France and England to photograph the same exact spots full of tourists. The Globe and Mail has an extensive before and after graphic reportage, but I couldn’t resist merging some of them in Photoshop. I love this type of montages. Seeing the peaceful enjoyment of all those vacationers next to the battle and its aftermath in very unsettling to me. I really don’t know if I would be able to have any fun in a place where thousands suffered and died. Above you can see an US Army Air Force’s Republic P-47 Thunderbolt crashed on Juno Beach, right in front of Saint-Aubin-sur-Mer, France. Original 1944 photo from the National Archives of Canada. August 2013 photo by Chris Helgren. Two tourists walk to Omaha Beach, near Saint Laurent sur Mer. The 1944 US National Archives photo shows American soldiers around a captured German bunker, one day after the landings. Some tourists walk along the seawall built by the Nazis on Utah Beach, near La Madeleine. Next to them, US Army Soldiers of the 8th Infantry Regiment, 4th Infantry Division, getting over that same wall and advancing forward on D-Day. Head to The Globe and Mail to see a lot more before and after photos. Copyright © 2019 Houraney.com. All Rights Reserved.